A look at New Sayings From Zhejiang, a collection of Xi Jinping essays from 2003 to 2007. I recently got hold of the book New Sayings From Zhejiang (之江新语), a collection of short essays Xi Jinping wrote between February 2003 and March 2007 for a column of the same name in the newspaper Zhejiang Daily. After quickly flipping through the book, my first reaction was that Xi Jinping turned out to be the first “blogger” among government officials. Of the 232 essays in the book, the longest is no more than 1,000 characters, with the shortest having a mere 200 characters. In length, these essays are close to today’s blogs and Weibo postings. New Sayings From Zhejiang is different from collections of leaders’ quotations in that it is short but comprehensive. The pieces have all the necessary elements — an argument, the explanation and quotations, and the conclusion. Yours truly can write several thousand words in an instant; compared to me, Xi’s essays are terse and forceful. Compared to the long-winded speeches of other leaders, Xi’s piece are far more readable. Reading the book carefully, it’s easy to see how well-read Xi Jinping is. Overseas analysts of China are understandably very interested in whether Chinese leaders are reading, whether they have time to read, and what kind of books they are reading. Leaders’ knowledge is formed by the books they read when they’re young, whether they continue to read, and what books they do read. This in turn is an important factor in determining the shaping and implementation of policy. Since China’s “reform and opening up,” China’s leaders have been front and center, attracting the attention of foreigners, but this hasn’t removed the air of mystery around these men. Looking at Xi Jinping’s own speeches, and the descriptions of those connected with him, he has loved reading since he was young. Some foreign observers have remained somewhat doubtful, believing that his administration will be shaped by the “lack of reading” that plagued his generation (Ed. Note: Xi and his generation had their formal schooling interrupted by the Cultural Revolution). But by reading this book, we can see that Xi himself has read quite a lot. Although the articles in New Sayings From Zhejiang are short, they don’t lack quotations. These quotes can be generally divided into two categories. One category is common folk phrases and the sayings of famous people. For example, the saying “be bold in imagining and careful in seeking proof” (大胆设想小心求证) comes from the famous Chinese scholar Hu Shi. The other category of quotations includes literary quotes and references, especially those from classical Chinese literature. I had to look up some of these quotes before I knew where they were from. Unless he simply has a book of famous quotations on hand, it would be difficult to use so many quotes so frequently without having read all of these classics. In his article “Three Steps for Studying”, President Xi Jinping referred to the three steps described by famous literary theorist Wang Guowei. This gave me an especially familiar feeling — when I first started studying for my Ph.D., my advisor Feng Chongyi told me to follow these steps. The tone he used in discussing them was very similar to the tone in Xi’s article. Just think, how many cadres and scholars will follow theses steps (the ones also recommended by my Ph.D. advisor) because of the advice of Xi Jinping? Looking at these essays, it seems that all these short pieces were written by Xi Jinping himself. For a provincial secretary (which he was at the time), regular reports are typically drafted by an assistant, but it’s hard for such articles to reflect the personal style of the leader. But New Sayings From Zhejiang has heavy stylistic features of Xi himself, the same features that appear in his unscripted and impromptu remarks. The consistencies are not only in style, but also in governing philosophy, personal style, and character. In New Sayings From Zhejiang, the longest and most numerous articles address two subjects: the CCP (including Party building, the “mass line,” and the cultivation of Party members) and concern for vulnerable groups, especially for the “Three Rural Issues” (agriculture, rural areas, and farmers). For example, in January 2005, President Xi Jinping wrote five consecutive essays on the “Three Rural Issues,” and another one appeared in 2006. When talking about the “Three Rurals,” Xi Jinping’s writing style loses its free and unrestrained aspects; you can tell that when it comes to these problems, Xi is uneasy. As for Party building, since Xi took office he has basically taken the thoughts he outlined in these articles (for example, fighting corruption and constructing a clean government) and implemented them step by step. Of course, Xi Jinping as a provincial secretary ignored his “proper duties” when writing these essays, which is exactly what I enjoy so much. For example, I discovered that one of his articles is the same piece that I want to write every year. The essay, “The Road Is Under Your Feet,” is written for children who failed the gaokao college entrance exam, as well as for their parents. Xi began this way: “It’s once again time to announce the results of the gaokao exam. Those who were admitted to university are of course very happy, but those who weren’t admitted shouldn’t feel pessimistic and definitely shouldn’t lose hope. The road is under your feet.” Reading this, I have to declare that I had not read this old essay of Xi’s when I wrote my own essay to children who failed the gaokao. Even if I were a plagiarist, I would be too embarrassed to plagiarize the president! The provincial party secretary is relatively high ranking and so is pretty busy. Taking the time to write such an article is neglecting his “proper duties” in a way. But it was well done. As everyone knows, each year China’s exams can cause deep depression in those who fail or don’t even meet the requirements needed to sit for the exam. Every year, more than a few children commit suicide over this. When I wrote my article comforting these children, pointing out that there is more than one path through life, I received many letters of thanks from parents and children. At that time, I thought to myself, I have no rank and no power, and I can’t reach many people. Why don’t our big-wig government officials do something about this? This is why I was happy to see “The Road Is Under Your Feet” in this book. In his essay, Xi said that he had noticed how the gaokao puts pressure on some children. The schools and especially the parents put a lot of pressure on the kids. For this reason, Xi called for China to “use every possible means to free the children from their grades.” This is a “down to earth” provincial secretary. I hope that Xi, after having assumed the office of president, can continue to focus on education, and finally reform our extremely exam-based education system. That way China can discover talent through more than one path. Speaking of “down to earth,” I suddenly feel that those three words best describe this book, which is why I described it as being like a collection of “blog posts” at the beginning. As a writer, I could identify with many of the short essays in this book, like “To Be Successful, First Learn How to Act With Integrity” and “Acting With Integrity and Being an Official.” In China, there are many people who can be an official or become rich, but there aren’t many who can act with integrity — especially among the highest officials. Authors often say “the writing is like the writer” and vice versa. Looking at the performance of Xi Jinping since he gained power, I think we can say “the writer is like the writing.” If that’s indeed true, then it’s great news for the “Three Rural Issues,” for students, and for those who have long suffered from bureaucracy and corruption! Can the “blog posts” written by Xi nearly 10 years ago be reproduced? 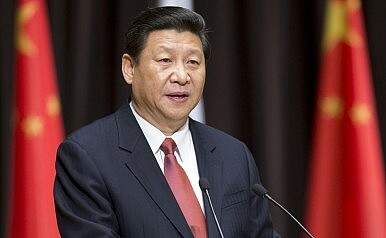 The Chinese system is somewhat unique, so its leaders don’t often have to give speeches or provide explanations in front of the media or the public. If there’s no dedicated channel for the leaders to speak, the masses can only guess what their leaders are thinking. Of course, various government documents and public statements can reflect how some leaders think about power and ideology, but these are, after all, “official documents,” and some are even deceptions. Officials often say that they need to occupy the high ground when it comes to public opinion. I think the best way to do this is to use a down to earth style to express personal views, just as Xi Jinping did when writing these essays. His style is both pointed and unrestrained. This style is not simple or crude, seeking to literally “seize” the high ground by suppressing other’s voices, or deleting other people’s blogs and microblogs. For all the bureaucrats who still need to learn this, I’m willing to send them free copies of Xi Jinping’s New Sayings From Zhejiang.